Homegrown tomatoes are something else: beautiful, rich fruits with the most divine aroma. But growing tomatoes successfully depends on avoiding some common pitfalls that can trip you up along the way. Knowing what to expect and what to do about it will greatly improve your chances of a truly terrific crop of tomatoes. Read on our watch our video to discover how to troubleshoot some of the most common tomato problems. Aphids and whiteflies are regular visitors from early summer. They often congregate in large numbers, sucking sap from your plants and leaving their sticky excrement, known as ‘honeydew’, on the foliage. Some types also transmit plant diseases. Small infestations can simply be blasted off with a jet of water. Or try spraying plants with a solution of soapy water, taking care to reach the undersides. To minimise potential problems attract pest predators such as ladybirds and hoverflies by planting flowers close by – marigolds are a good choice. You can even buy these predators to introduce into enclosed environments such as a greenhouse. Warm, dry conditions are perfect for spider mite, which like aphids and whitefly can quickly weaken plants. Look out for their faint webbing. Peer closer and you may be able to see the tiny, usually red, mites. 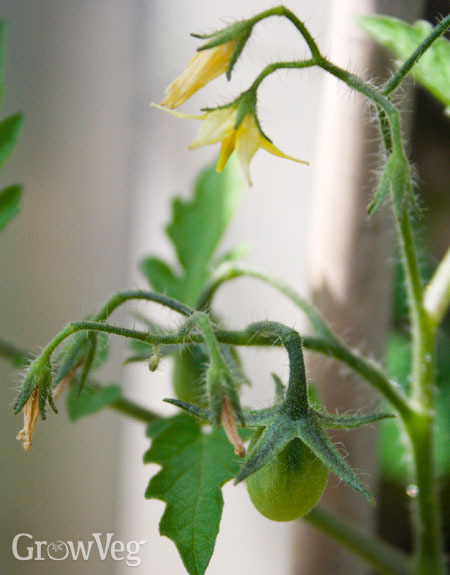 Spider mites love drought-stressed plants, so don’t let your tomatoes dry out. If spider mites do attack, spray the foliage with a fine mist of water, ensuring you reach all parts of the plant. Then cover the plant with a row cover for a few days to create the shady, humid conditions that will repel the mites. Late blight strikes during spells of warm, wet weather. Foliage and then the fruits become covered in brown blotches; eventually the plant simply wilts and collapses. Late blight also affects potatoes, which are related to tomatoes. Blight is rare on indoor tomatoes, so grow plants under cover if it’s been a problem in the past. Avoid splashing the foliage when watering, and remove and destroy infected plants as soon as you spot the first signs of blight. You could also grow varieties described as ‘blight resistant’. Blossom end rot is a disease caused by dry soil conditions and a shortage of calcium. Fruits form sunken black patches at the blossom end of the fruit. Ensure your tomatoes have enough water at all times, and feed them regularly with a liquid tomato fertiliser. This is the best way to guarantee your plants are getting all of the minerals and nutrients they need for healthy growth. Pay particular attention to plants in confined spaces, such as pots or growing bags. Irregular watering often leads to split fruits, when a sudden rush of water causes the fruits to swell quicker than the skins surrounding them. Instead of leaving soil to completely dry out between each watering, aim for consistent soil moisture. Water regularly and mulch tomatoes with plenty of organic matter to keep roots cool and moist. Mineral deficiencies usually show up in the leaves first. Magnesium deficiency is the most common form and often arises as a result of high potassium levels. To correct the deficiency, spray a solution of Epsom salts directly onto the foliage then switch to a tomato feed that contains a higher proportion of magnesium. Plants can wilt when the soil is either too wet or too dry. Too wet and the roots literally drown, while very dry soil won’t supply plants with all the moisture they need. Pay close attention to watering. Containers of tomatoes should have good-sized drainage holes at the base so that excess water can drain out. Raise containers up onto pot feet if water doesn’t drain away easily. In all cases, water generously when it’s dry, or set up an irrigation system if you can’t be there to water. Later on in the season mature plants with lots of foliage may need watering twice a day. Poor fruit set, when flowers fail to produce fruits, is a very common problem. A lack of bees, excess heat, poor nutrition, and very dry or humid air are all possible causes. Make sure pollinating insects such as bees can reach plants growing in greenhouses and tunnels. Improve pollination by simply twanging or tapping on supports to dislodge the pollen, or gently twiddle the flowers between your fingers. Provide as much ventilation as possible in hot weather. If your climate’s also very dry, raise the humidity around plants with regular watering. And make sure to feed your plants regularly with either an off-the-shelf tomato feed or a homemade high-potassium liquid fertiliser such as comfrey tea. Don’t be put off by all these potential problems. So long as you know what you’re looking at and react quickly, your tomatoes are likely to recover. Please drop us a comment below to let us know about any other tomato problems you’ve encountered and how you got around them. "My toms - growing in a repurposed recycling box with runner beans now in full fruit - have brown lesions on the leaves which start within the leaf and have a dark line round the edge of the dead bit like the dark line you get at the edge of a stain on cloth. From looking online the differential diagnosis is K deficiency or Septoria though neither have pics exactly like mine. The runner beans leaves are a bit pale but only a few are browned. With 4 runners and 2 toms in a 40 litre box (50x35x25H cms) I am sure they are overcrowded. I have been feeding with Doff Container and Basket Feed but noticing it had no Magnesium I gave it a spray of Andrews Liver Salts yesterday and today got some Westland Tomato food. Have I got Septoria? Underside of leaves just light brown lesions; no sign of life. The fruit are just setting and look fine What to do?" "Hi Steve. That's a really tricky one to answer without seeing the pictures. It could be septoria, or full-blown tomato blight. If your tomatoes are still alive then it won't be the latter! Overcrowding is probably a big reason behind the problem anyhow. All plants need enough light and airflow to keep them healthy, growing strongly and better able to shrug off disease. It's probably too late now - though certainly feeding with a liquid tomato feed will have a lot of benefit if it's related to nutrient deficiency. Next year I'd recommend giving plants the full space they need, even if it means growing fewer plants. The overall outcome and yield will be higher if plants can grow unfettered." "Thanks Ben. Can I send pics to this site? Can't see how to. The local (as in other side of a narrow road) church had a plant sale and I overbought. Then OH used most of the containers I planned to use for other stuff so I finished up making do. I have just bought 10x 60 litre flexitubs (Homebase £3.50) so will be fine next year. All has grown splendidly. The runner beans are up to 8ft and the toms spreading out from the pot and up to 4ft plus. Could hardly have more beans on the plants and the toms setting well - had the first ripe one yesterday but most just setting. I water a lot - huge demands on only 40 litres of soil - and had used a general liquid feed (Doff Container + basket)until I learned about Mg deficiency in toms. Which the brown could be. So i sprayed them with Andrews Liver Salts (to hand) until I got tom feed. I now have two - Westland and Levington Tomorite. Any preference? I may have stopped the browning - time will tell. Thanks for your help." "PS I just read about beans putting Nitrogen into the soil (which I knew intellectually but had not thought of in this case). Will that disturb the N P K balance, and does it matter? " "Hi Steve. It sounds like you've now got everything under control, and more root space next year will certainly make life easier for your plants (and you!). I have no preference on the tomato feeds you've mentioned - they're both good brands and if they're marketed specifically for tomatoes you'll be fine. The tomatoes won't be affected by the nitrogen put into the soil by the beans. The beans will be using most of this nitrogen - it would really only be properly released into the soil when the beans die back - and even then there wouldn't be enough to disturb the NPK balance overly." "Hi, I've had a really good crop of tomatoes thus far. But, now most of the fruit at the ends of the longest stems (and it's a huge plant) have not completely developed before they just seem to collapse. Like a balloon that the air has gone out of. any ideas? We live in the high desert area (3600 ft) of So.California, so very hot and dry...watering once a day on a drip line for about 45 minutes. Thanks, Karen"
"Hi Karen I am no expert at my elevation of 360ft on the England/Wales border (Chirk) let alone in your conditions but try VASTLY more water. Tomatoes need a lot. eg we had about half an inch last night but I have just had to water mine (in containers) because the compost is almost dry. Remember tomatoes are almost all water and if you have a huge plant it all needs to get there through the central roots; plus water for photosynthesis. Do your leaves look happy? Just about to eat a mix of home grown toms! Best wishes Steve"
" Hi Karen. To echo Steve’s points above, it could be that the tomato plants have simply outgrown their capacity to supply enough nutrition and water to the developing fruits. This would especially be the case if the roots are limited by growing in a container, for example. So while you may be supplying enough moisture and nutrition, it could simply be that the roots find it physically impossible to take it all up in enough time and quantity to service all parts of the plant. " "Hi, our tomatoes in different plots and different types have yellow marks as they are ripening. Some are round raised spots, What is the cause?" "Hi Susan. The tomatoes could potentially have either 'greenback', where uneven ripening occurs, or blossom end rot. You'll know if you have blossom end rot because the end furthest from the stalk will be sunken, brown and starting to rot. If they aren't, then it could be greenback - a disorder that affects older heritage/heirloom varieties more than modern cultivars. There isn't much you can do about greenback, but making sure plants are properly fed will help to reduce the symptoms of this disorder."